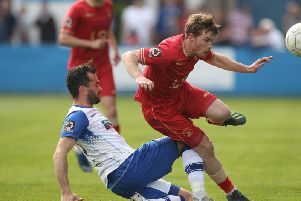 Lethal Lewis Alessandra helped himself to a hat-trick for Hartlepool United – but insisted that 90 minutes of fitness was the key success from the friendly win at Guisborough Town. Alessandra played down his treble in the 6-0 win at the King George V Ground last night, when he also proved his worth with his play alongside fellow frontmen, Billy Paynter and Padraig Amond, who were also on the scoresheet at the Northern League club. It was nice to get goals which, if we’re looking at ourselves critically, we’d not been doing in the last couple of games. “It’s nice to hit the back of the net and no-one would turn up their nose to a hat-trick,” said the 27-year-old. But last night was more than just a training exercise – Pools performed much better than they did at Livingston on Saturday, when they drew a blank. Craig Hignett’s side could have scored more than six, though that may have been harsh on their hosts. “We played some good stuff and created a lot of chances,” said Alessandra, who scored the second goal at the North Yorks ground before tucking the ball away neatly twice in the closing minutes. “OK, the opposition, with no disrespect to Guisborough, is not going to be the level we are going to face in the league, but we played well. “It was nice to get goals which, if we’re looking at ourselves critically, we’d not been doing in the last couple of games. “Obviously on Saturday we had a goalless draw up at Livingston, so it was good to put that right. “For myself, I could have had more, because there were other chances.